My mother likes to tell the story of the night she went into labor with me. She had been climbing a ladder at a client’s house just a few hours before, installing new drapes and valances in their living room. For dinner that night she and dad had salmon croquettes. And then a little while later her water broke and I arrived just before one in the morning on my due date. It’s a random little string of inconsequential events that she would otherwise never have remembered except that it happened to precede the birth of her only child. I’m not sure if it’s the repetition of this story throughout my childhood or the fact that my final in utero meal was a salmon croquette, but I have always been incredibly found of all manner of fish cakes. I love the strange chewy Vietnamese fish balls in pho, I adore crab cakes and salt cod croquettes. It had been a long time since I had made fish cakes at home, so I was pretty excited to make a middle eastern inspired cod cake in a spicy, smoky tomato sauce for dinner on Saturday night. I thought they were delicious. Matt thought they were interesting. I wanted to call my mom and tell her that I had one-upped her salmon croquettes, but I didn’t. The next night, I was preparing a far fancier meal. I peeled and carved and cubed and roasted butternut squash. I caramelized onions, low and slow in my favorite skillet until they were silky soft and sweet. I made a pastry crust with two sticks of butter, sour cream, and a touch of champagne vinegar and rolled it into a circle, so large it barely fit on my counter top. I grated cheese. I minced thyme. And I salivated non-stop for the better part of an hour. The end result was a golden brown, slightly sweet, and perfectly buttery pastry, which I have since eaten for dinner, breakfast and lunch. In the middle of my obsessive pastry making, my mom called. “I’m doing something very culinary,” she says on my voicemail, “And I had to call and tell you. I just caramelized my first pecans.” She went on to tell me the guest list for her dinner party and what they were celebrating and how much she was looking forward to it. I was actually sad I missed her call and sometime between marinating the pork tenderloin and ironing the table cloth before our dinner guests arrived, I thought I might take a few minutes to call her back, but I didn’t. “I think of you much more often than I call you,” she ended her message to me. Me too, mom. Me too. In a bowl, combine the flour and salt. Add both sticks of butter and, using a pastry blender, break up the bits of butter until the texture is like cornmeal, with the biggest bits the size of pebbles. In a small bowl, whisk together the sour cream, vinegar, and water, and pour this over the butter-flour mixture. Stir with a spoon or a rubber spatula until a dough forms, kneading it once or twice on the counter if needed to bring it together. Pat the dough into a ball, wrap it in plastic, and chill it in the refrigerator for 1 hour or up to 2 days. Preheat your oven to 400 degrees. Peel the squash, then halve and scoop out the seeds. Cut into 1/2-to-3/4 inch chunks. Pour 2 tablespoons of the olive oil into one large or two smaller baking sheets, spreaking it to an even slick. Lay the squash chunks on the baking sheet in one layer, sprinkle with 1/2 teaspoon of the salt and freshly ground black pepper, and roast for 30 minutes, or until squash is tender, turning the pieces occasionally so that they brown evenly. Set aside to cool slightly. Leave the oven on. While the squash is roasting melt the butter and the remaining tablespoon olive oil in a heavy skillet, and cook the onions over medium-low heat with the sugar and the remaining teaspoon of salt, stirring occasionally, until soft and tender, about 25 minutes. Stir in the cayenne pepper, if you are using it. Mix the squash, onions, cheese and herbs together in a bowl. On a floured surface, roll the dough out into a 16-to-17 inch round. Transfer to a parchment-lined baking sheet. Spread the squash and cheese mixture over the dough, leaving a 2-to-2 1/2-inch border. Fold the border over the squash and cheese, pleating the edge to make it fit. The center will be open. Brush the outside of crust with the egg-yolk wash, if using. Bake until golden brown, 30 to 40 minutes. Remove the galette from the oven, let stand for 5 minutes, then slide it onto a serving plate. Cut into wedges and serve hot, warm, or at room temperature. Tags: fall, pastry, recipes, vegetarian | Permalink. Run, cook, eat, sleep, repeat. Hmmm, Sarah, I just bought everything to make the same galette. 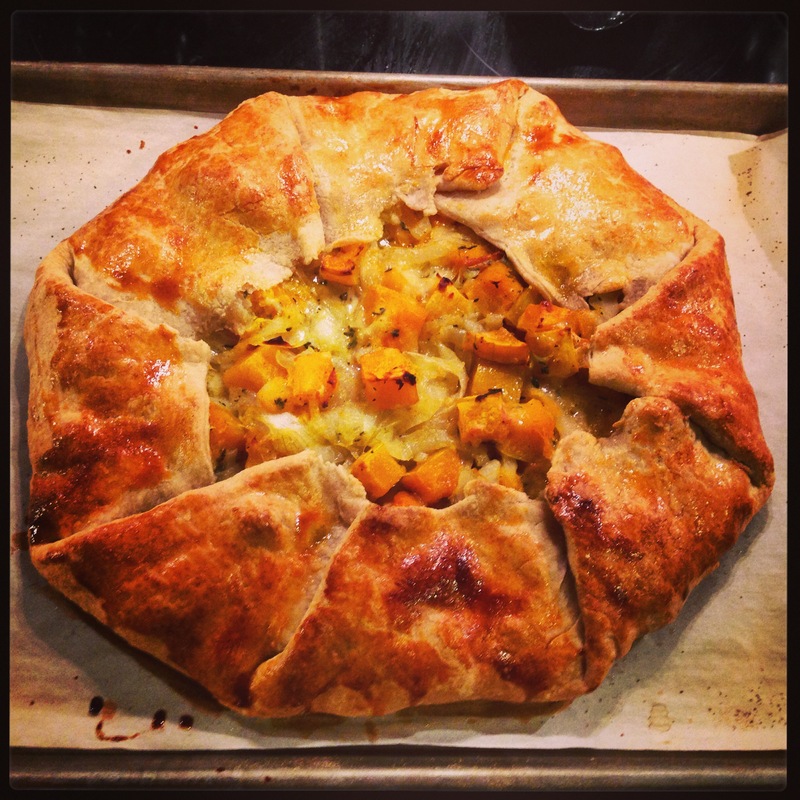 I’ve made the burst tomato galette many times this summer and it was delicious. It uses the same crust, so I have high hopes for the squash thing. i have to tell you how much I enjoy your blog. Great fun! Thanks Terry! And thanks for reading.